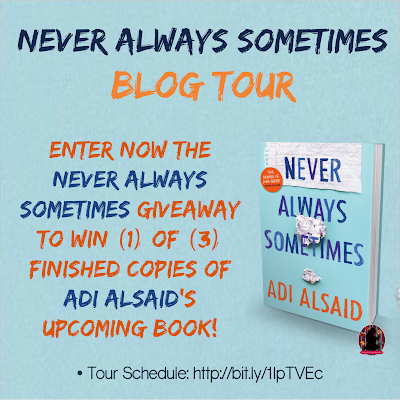 Welcome to my spot along the Never Always Sometimes blog tour! Adi was a 2014 debut author, with his road trippin’ contemporary romance called Let’s Get Lost. I love keeping up with our former debuts and seeing what they’ve been up to since their first book debuted. 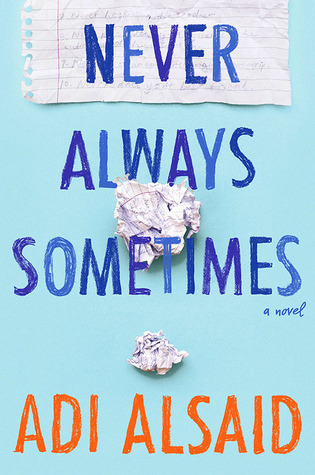 Let me introduce to you Adi’s new book, Never always Sometimes, which comes out on Tuesday, August 4th! Read a little about the book, plus I’ve included some quotes from the book that I enjoyed to whet your appetite. Some of the rules have been easy to follow, like #5, never die your hair a color of the rainbow, or #7, never hook up with a teacher. But Dave has a secret: he’s broken rule #8, never pine silently after someone for the entirety of high school. It’s either that or break rule #10, never date your best friend. Dave has loved Julia for as long as he can remember. “No point in living a life less ordinary if you don’t know what the other side looks like. “We are more or less kind, or more or less not. More or less selfish, happy, wise, lonely. Just like things are rarely always true, we aren’t ever exactly one thing or another. We are more or less.